In 2012, the AAFP created the Cat Friendly Practice® (CFP) program. Each approved CFP practice has demonstrated its dedication to increasing the quality of care felines receive. The Cat Friendly Practice® elevates its care standards and educates owners about the importance of cat wellness and disease prevention. The AAFP’s website is a great resource about caring for cats. You’ll find their list of cat-friendly vets HERE! 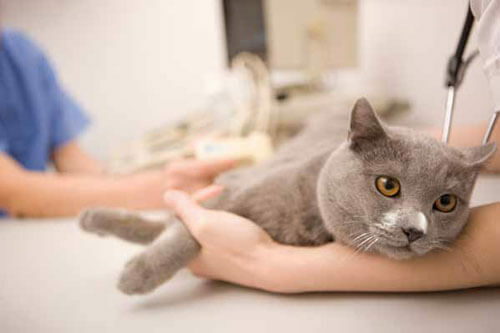 Cat receiving a physical examination by the veterinarian. To achieve certification, the practice and its team must have a completely new perspective with the cat in mind. Staff must be trained on the distinct needs of cats, and each practice must designate a “cat advocate” who ensures feline standards are met. The practice’s physical environment is also assessed. A low-stress environment will include a separate entrance and waiting room and feline-only exam rooms, devoid of dog smells and noises. To redeem: Simply print or mention this offer to our customer service representative. Limit one per client. Valid to new clients and cat patients, only. Cannot be combined with any other offer. Feline-friendly practice staff are well versed in handling techniques. They can expertly treat frightened cats and have alternative techniques to calm anxious animals. An individualized healthcare plan is created specifically for each cat, and this may include more than a once-a-year physical to help diagnose diseases earlier. Feline-friendly practices create a reduced level of anxiety in both cats and their owners, ensuring a lifetime of health for our feline friends.